Next week, the Physics Central team will be in Denver, Colorado helping out with this year's APS March Meeting. We hope to see some exciting news coming out of this year's meeting (look out for Roboclam). Our images and video gallery is now up. Check out some of the cool visuals that physicists have been developing over the last year! 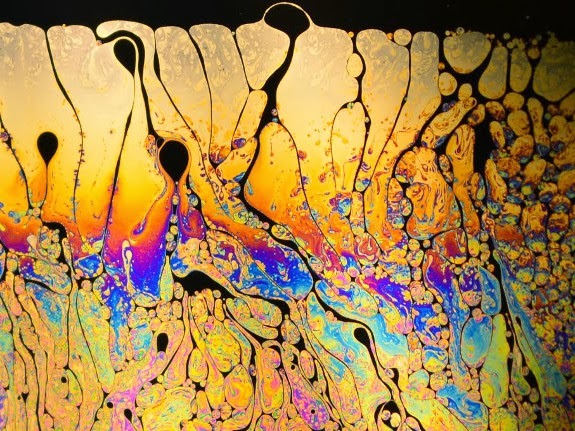 Soap film colors are caused by thin film interference and allow the observer to know approximate thickness of the liquid membrane. Forces in the film cause some portions to become thinner and appear black. Credit: Collin Pearsall and Vivek Sharma University of IL. Kellogg’s tasty pastry, the Pop-Tart, celebrates its 50th anniversary this year. Since Pop-Tarts first came onto the breakfast scene in 1964, they have spurred some crazy ideas. From Pop-Tart Ice Cream Sandwiches to flying, rainbow Pop-Tart cats, some of the ideas are tastier than others. In celebration of Pop-Tarts’ 50 years of sweet service, here are five science experiments that Pop-Tarts have inspired over the years that you can test yourself. Strawberry frosted Pop-Tarts. Credit: Evan-Amos. 5. Last year, a student at Kaneohe elementary tested the fastest way to cook a Pop-Tart without electricity. The student followed the six steps of the scientific method to determine whether apple wood, charcoal or a solar oven was most efficient. To the student’s surprise, the apple wood cooked the Pop-Tarts the quickest. On this week's Physics Central Podcast I've got an amazing story of how physics could improve quality of life for thousands of people. Researchers at Harvard Medical School and the Massachusetts Eye and Ear Infirmary are working on a new cochlear implant device which would eliminate the need for external hardware, and help the wearer better determine the direction of sounds. 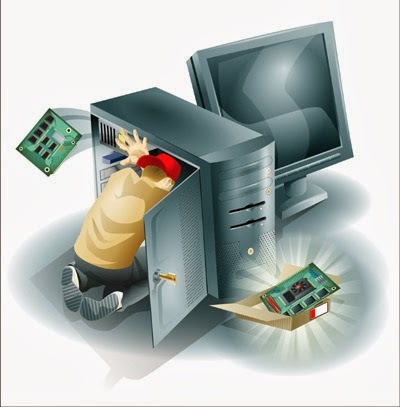 The new design is based around a new, low-power signal-processing chip developed by researchers at the MIT Microsystems Technology Laboratory. The chip is low power and wirelessly chargeable, removing the need for an external battery pack. It also combines with other technology to remove the need for an external microphone, and instead uses the wearer's natural ear. Listen to this week's podcast to learn more. Last September, two telescopes captured a spectacular flash of light on the moon's surface lasting more than 8 seconds — the longest and brightest flash ever confirmed on the lunar surface. Scientists have now attributed the record-breaking flash to a meteoroid impact and the resulting vaporization of plasma in a paper published online yesterday in the Monthly Notices of the Royal Astronomical Society. Despite the huge flash, the cause was relatively small — a rock about one meter across. Nonetheless, researcher Jose Madiedo (University of Seville) and his team estimate that the rock slammed into the surface at speeds exceeding 50 kilometers per second, leaving a crater roughly 45 meters wide. A picture of the lunar impact from September 11, 2013. 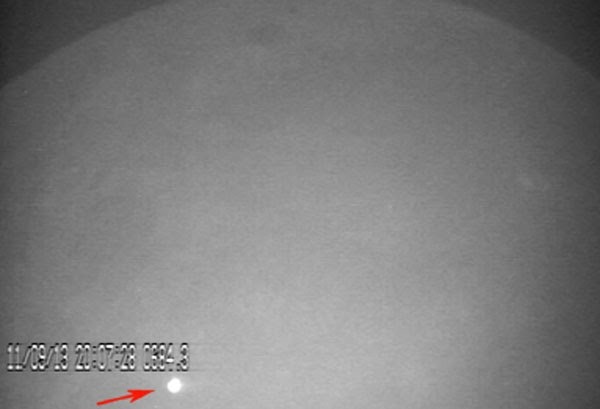 The flash caused by a meteoroid impact lasted for over 8 seconds — the longest flash ever confirmed. While the world watches Olympians skate, jump and fly through the air in Sochi, researchers have turned their eyes to a much tinier but equally impressive athlete: the humble field ant. The largest ground-based astronomy project of all time perches more than three miles above sea level in one of the driest deserts on Earth. 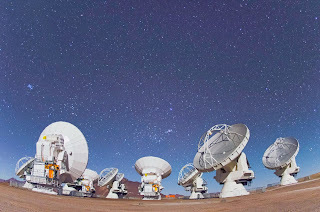 A particularly parched region of the Atacama Desert in South America is the Antofagasta Region, which is where the Atacama Large Millimeter/sub-millimeter Array calls home. ALMA is the “hardest place on the planet to work” according to astronomer Joaquin Vieira. Vieira, who is an assistant professor of astronomy at the University of Illinois at Urbana-Champaign, knows what it’s like to work in harsh conditions. About six years ago he spent a month and half in the South Pole helping build the 10-meter South Pole Telescope. With that telescope, Vieira and fellow team members surveyed a part of the sky mapping out locations of distant galaxies. Years later, Vieira directed ALMA to that same spot on the sky and, with a team of more than 60 scientists, published the results that reinterpreted our picture of galaxy evolution. We're right in the middle of the 2014 Winter Olympics in Sochi, so for this week's podcast I decided to talk to Physics Central's resident snowboarding expert, James Riordon (also known as Buzz Skyline), about the physics behind this awesome sport. Go listen to it! You can also read Buzz's post about the 1440 Triple Cork right here. There is a TON of physics in the winter Olympic games and you can learn all about it via this amazing video series produced by the National Science Foundation and NBC. There's a series about engineering in the Olympics as well. Right now, the Milky Way hosts about 100 billion stars and each year that number grows. The growth rate of new stars, however, is a sluggish crawl compared to what it was a few billion years ago, explained Dominik Riechers at this year’s American Association for the Advancement of Science annual meeting in Chicago, Illinois. Riechers is an assistant professor of astronomy at Cornell University who studies galaxies and how they form and change over time. Galaxies are stellar factories, manufacturing new stars each year. 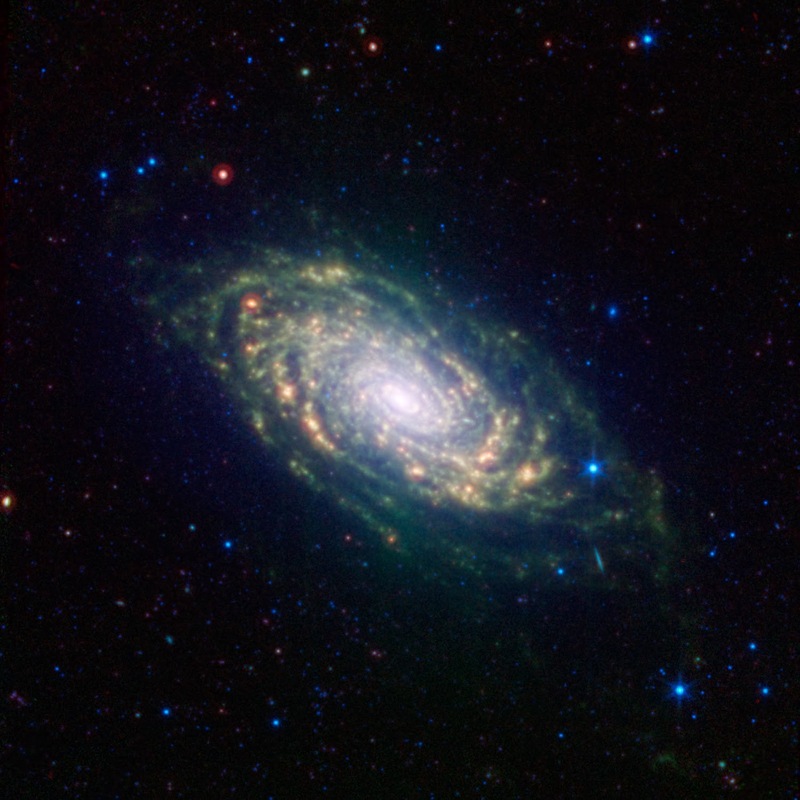 Astrophysicists describe a galaxy’s star formation rate by the total mass of new stars it produces annually. Today, the Milky Way creates between one and two times the mass of our sun in the form of stars each year. But this was not always the case. If you add the mass from all of the stars in the Milky Way, you could make about 70 billion stars the size of the sun. The Milky Way would take about 35 billion years to produce this amount of mass in the form of stars at its current star formation rate of two solar masses each year. Since the age of the universe is 14 billion years old, astrophysicists know that the star formation rate of our galaxy must have been higher during its former years, Riechers said. Happy day-before Valentine’s Day! Do you have your heart-shaped box of chocolates, yet? Or perhaps you’re like me and are waiting for the day after to snag the tasty treats for half the price. The saying goes: You get what you pay for. So, is the quality of those chocolates worth what your love-sick friends are paying today or what I’m paying a few days from now? That question is steeped in marketing ploys and economics, so I can’t give you a straight answer, or even a heart-shaped one. What I can give you is a rundown for what quality chocolate means to a chocolatier and what kind of sweet physics melts into action the second it hits your tongue, teasing your taste buds for more. This week on The Physics Central Podcast I'm talking to science writer and author Amanda Gefter, who has written a book that wraps up cuttings edge physics in a blanket of memoir. Tresspassing on Einstein's Lawn tells the story of Gefter and her father pursuing answers to questions like "What is nothing?" and "What is the nature of ultimate reality?" Their quest took them to physics conferences (occasionally under false pretenses) and late one night, onto the lawn of Albert Einstein's former home. Listen to the podcast to hear about some of the tough physics questions Gefter tackles in the book (like the fact that your point of view creates a unique universe that exists independently of everyone else's unique universe), as well as some insight into where physics and philosophy intersect. Right now, for the first time in Olympic history, women are taking to the ski jumping slopes to compete for Olympic gold. If they were on the Moon how far might they fly? Would they surpass the Moon’s escape velocity and go soaring through space? Or would they manage to circle around the circumference of the Moon before landing? Neither. The provocative, counterintuitive answer is that they would travel about the same distance! The women are competing on the smaller of the two hills, the normal hill, at the RusSki Gorki Jumping Center. The center’s normal hill is a K95. The K stands for K point, or critical point, which is a target for skiers, and the 95 means that the target point is 95 meters away from the launch point. If skiers jump a distance of exactly 95 meters (about 312 feet) then they earn 60 points. They are either awarded or penalized points for how many meters they surpass or fall short of the K point. 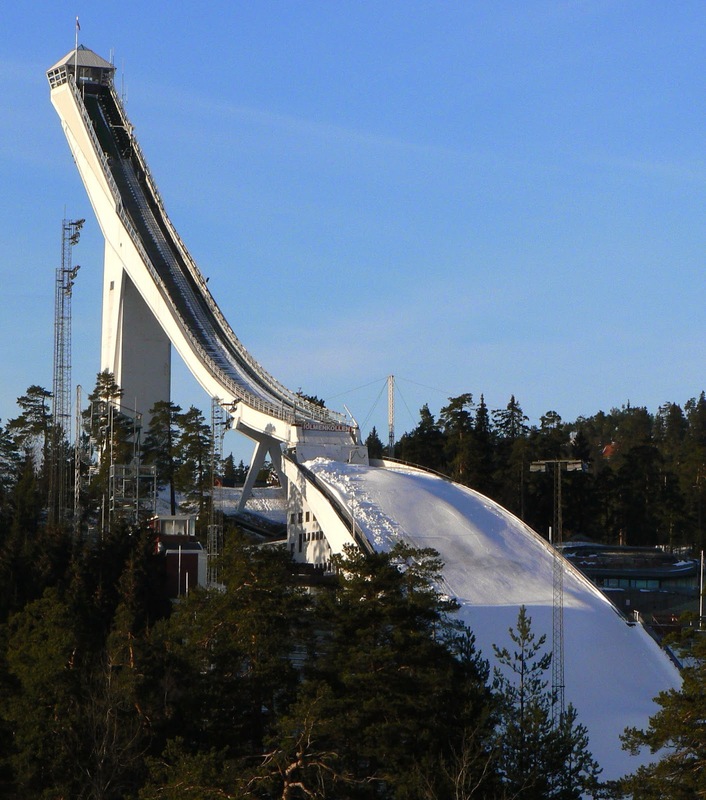 Ski jumpers have a number of tactics they use to make sure they fly longer and farther than any of their competitors. Ski length, body position, weight, strength and air resistance are some of the factors that determine how fast the skier flies off the ramp, how long they’re in the air and how far they travel. 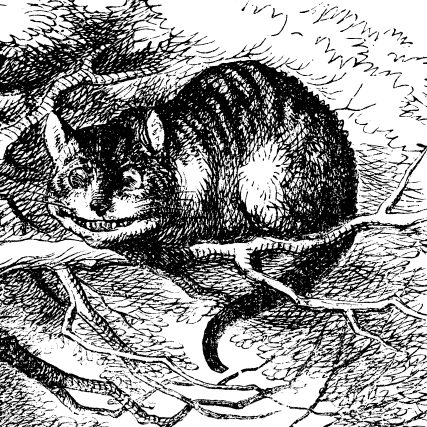 Cheshire Cat knows where infinities go. Solving the mystery of the controversial (and errant) claim that 1+2+3+4+... =-1/12. In the previous post on this subject, I somewhat tentatively asserted that the sum of the natural numbers up to infinity (1+2+3+4+ . . .) does not equal -1/12. So what does it equal? The answer, at least as far as realistic problems I can wrap my head around goes, is -1/12 plus infinity. For the next few weeks, much of the world will keep its eyes fixed on Sochi as athletes compete on the biggest stage in international sport. While there's plenty of physics happening on the ground, NASA has also chosen to participate from above. 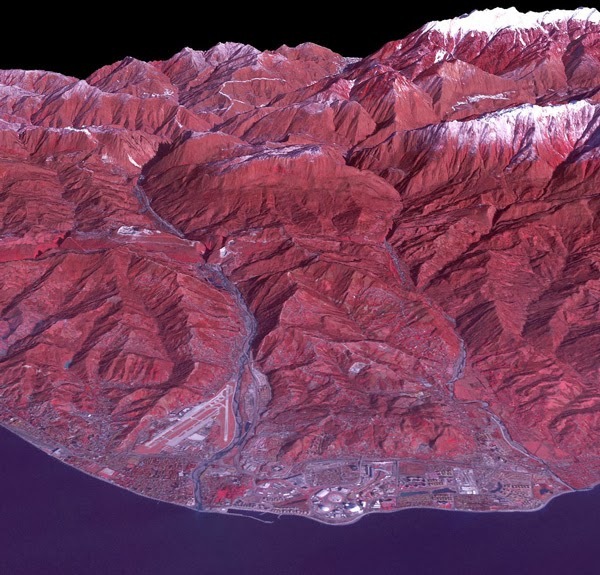 A false color image of the coastal Olympic Cluster in Sochi, Russia taken by a NASA Landsat satellite in 2013. 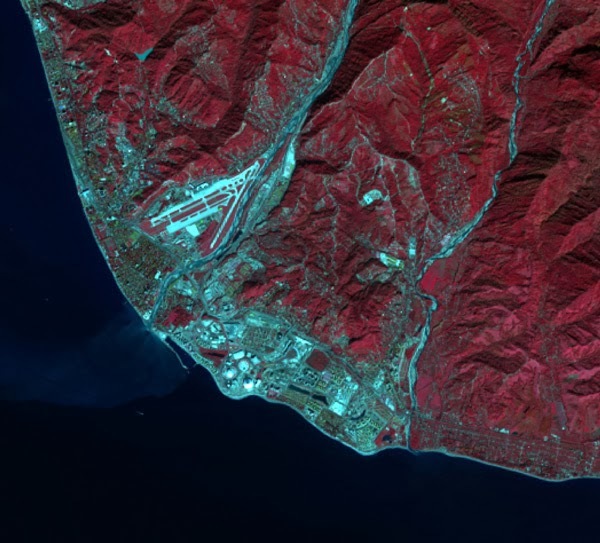 Another false-color image of the coastal area for the Olympic Games (notice the same airport on the left side of the image). Red represents vegetation; gray represents building; white represents snow; and the Black Sea sits in the foreground of the image near the bottom. The ASTER mission, a joint mission between the U.S. and Japan, captured the image above. Image Credit: NASA/GSFC/METI/ERSDAC/JAROS, and U.S./Japan ASTER Science Team. Dark matter is currently one of the greatest mysteries in the universe. Now, scientists reveal that the most powerful particle collider in the world has unearthed no signs of the hypothesized dark matter, placing new limits on what it could be. The Moon likely formed when a giant body collided with Earth, chomping a hungry bite out of it in a spectacular collision billions of years ago. That’s the abridged bedtime story, at least. There are still many pages missing from the Moon’s biography. For instance, scientists are unsure about the size and speed of the colliding object, the percentage of debris that fell to earth, flew into space or formed the moon and how long it took the debris to condense toward a single, compact body that now floats in space 240,000 miles from Earth. Although scientists have an idea about the beginning and end of the story of the Moon's origin, the steps in between are less understood. For example, a disk of material likely formed out of the scattered debris and wrapped itself around the Earth shortly after the collision. The structure of this disk is not known, but scientists think that it says a lot about why the Moon is one eightieth the mass of the Earth and how long it took the Moon to form, lending information about the satellite's chemical composition. Caltech planetary scientist David Stevenson and planetary scientist graduate student Miki Nakajima offer the most detailed analysis of the type of disks that might have formed after the initial collision. They present their results in a paper recently accepted for publication in the science journal Icarus and can be found on the scientific paper repository arXiv. The scenario in the video, one of multiple simulations that Stevenson and Nakajima are working on, is of a Mars-sized object colliding with pre-moon Earth. The color scale on the bottom right of the screen measures the objects’ entropy, which relates to temperature. You can see that after the collision -- as the dots change from red to yellow -- the temperature of Earth increases over time while the resulting disk remains relatively cool. Rapper DMX has answered the infamous George Zimmerman's call to a celebrity boxing match. They will fight on March 1. Here's a few tips DMX should keep in mind to hold his own in the ring. Boxing has a recipe for success and the ingredients include technique, timing and accuracy. With the right technique and timing you can maximize the force you transfer to your opponent. And you can do the most damage with a powerful punch to the right location, and buy yourself extra precious seconds while your opponent recovers. 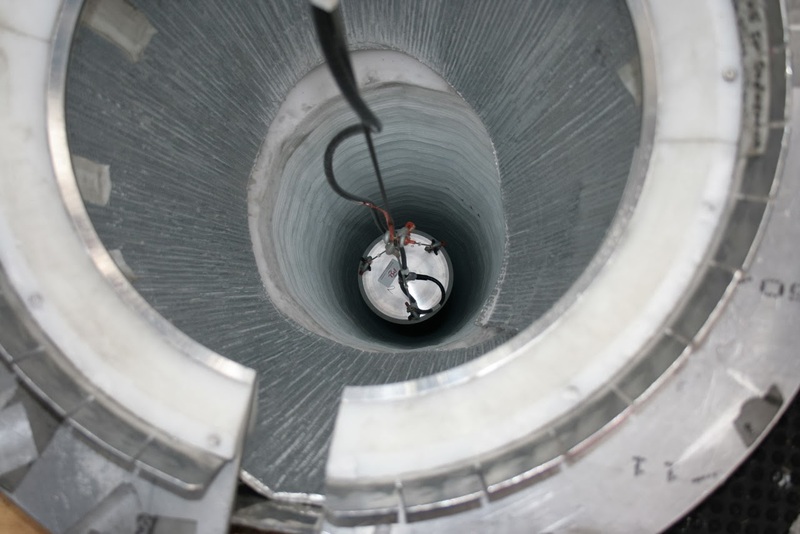 Buried underneath a mile of solid ice at the bottom of the world, two instruments are at the forefront of a new effort to corroborate or refute one of the most controversial scientific results in the ongoing search for dark matter. One of the DM-Ice17 detectors being lowered into the ice at the South Pole in 2010. The University of Wisconsin's DM-Ice17 experiment wrapped up two years of data collection at the South Pole in its hunt for the universe's missing mass. The two prototype detectors, immersed under a mile and a half of solid ice, are looking for the faintest pinpricks of light from a single particle of dark matter colliding with an atom. The two detectors finished their run in June and are the precursors to a future experiment that will be able to see if the Earth is passing through a cloud of invisible dark matter. It's the first experiment to look for dark matter south of the equator.